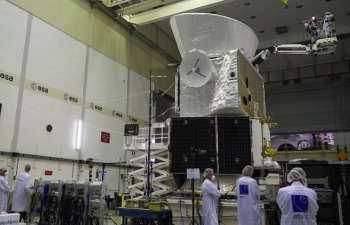 Set for launch next year, the BepiColombo spacecraft is coming to the end of its test phase ahead of being shipped to Kourou, French Guiana in readiness to begin a journey to Mercury, opening with a ride on the Ariane 5 rocket. The final major processing tests involved being shaken on a vibrating table and stacked into its launch configuration in ESA’s technical center in the Netherlands. BepiColombo is a joint mission between ESA and the Japan Aerospace Exploration Agency (JAXA), executed under ESA leadership. It has been years in the planning, but has been delayed several times from its original launch date of 2013. 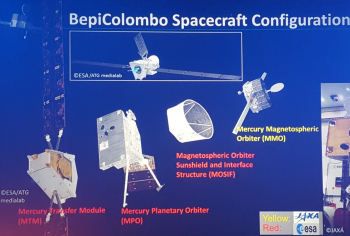 BepiColombo consists of two orbiters: Japan’s Mercury Magnetospheric Orbiter (MMO) and ESA’s Mercury Planetary Orbiter (MPO), both of which will be carried together by the Mercury Transport Module. The elements have been successfully tested individually, but the recent tests have involved the integrated spacecraft, as it will be when it rides uphill on the Ariane 5 launch vehicle. The spacecraft needs to survive the challenges of launch in order to be safely – and healthily – released on its path towards its mission to Mercury. As such, the integrated spacecraft stack was tested inside the acoustic chamber, where the walls are fitted with powerful speakers that reproduce the noise of launch. It was then placed on a vibration table, to mimic the intense vibrations experienced by a satellite during launch. The complete stack was shaken at a range of frequencies, both in up-down and side-to-side motions. The spacecraft was shaken for just over one minute, during which the frequency of vibrations increased from rest to 100 Hz. At the lowest frequencies the spacecraft movement amplitude at its base was largest (+/- 6 mm); it then continually decreased as the frequency continued to rise, to keep the accelerations within the targeted limits. The dynamic response of the tall structure can be seen at the lowest frequencies where the eye can follow the movements. At frequencies higher than 25–30 Hz, the eye cannot see it anymore, giving the impression it is at rest. The spacecraft won’t be leaving the Netherlands just yet, as the assembly will be dismantled to prepare the transfer module for its last test in the thermal–vacuum chamber. This will check it will withstand the extremes of temperatures en route to Mercury. Tests will also include solar array deployment testing. Despite travelling towards the Sun, the transfer module requires a large 30 meter solar array. 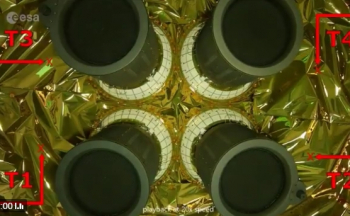 Temperature constraints mean they cannot directly face the Sun for long periods without degrading, so they have to be angled and thus require a greater area to meet BepiColombo’s power demands. 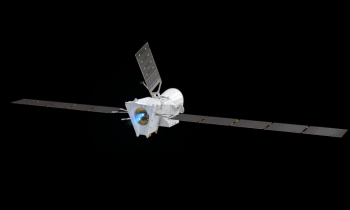 The spacecraft and mission will then head towards a final ‘qualification and acceptance review’ of the mission early next year, before BepiColombo will be flown to Kourou, French Guiana, in preparation for the October 2018 departure window. No specific launch date will be set until next year, although the current estimate has it launching within weeks of another flagship mission, namely the James Webb Space Telescope, also set to launch on an Ariane 5 rocket. The carrier will use a combination of electric propulsion – which also recently underwent steering tests – and multiple gravity-assists at Earth, Venus and Mercury to complete the 7.2 year journey to the Solar System’s mysterious innermost planet. 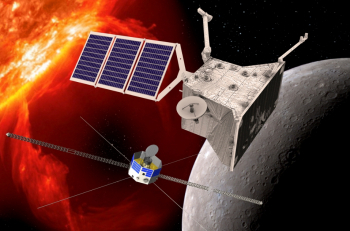 After arriving at Mercury, expected to be in December 2025, the modules will separate, and from their respective orbits the science orbiters will make complementary measurements of Mercury’s interior, surface, exosphere and magnetosphere, following up on many of the open questions raised by NASA’s Messenger mission. BepiColombo will investigate properties of the innermost planet of our Solar System that are still mysterious, such as its high density, the fact that it is the only planet with a magnetic field similar to Earth’s, the much higher than expected amount of volatile elements detected by NASA’s Messenger probe and the nature of water ice that may exists in the permanently shadowed areas at the poles. NASA’s MESSENGER (MErcury Surface, Space ENvironment, GEochemistry, and Ranging) spacecraft ended its mission in 2015 with a dramatic, but planned, event – crashing into the surface of the planet that it had been studying for over four years. The follow on information from BepiColombo will provide more data about the origin and evolution of a planet close to its parent star, providing a better understanding of the overall evolution of our own Solar System.